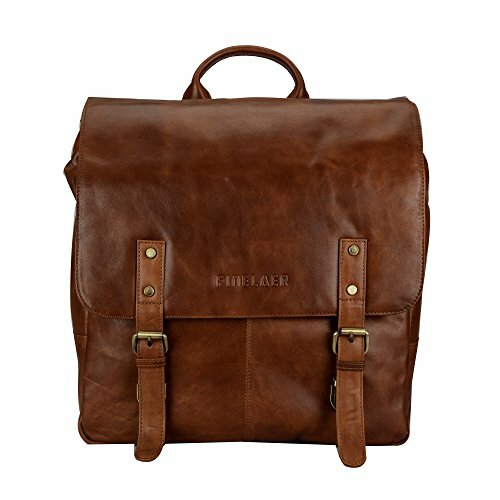 Nothing is more convenient for traveling than a backpack in soft yet durable leather from the finest cowhide tanned to perfection. Suitable for all ages from the young at heart to the mature and elegant, this backpack is an ideal addition to your everyday bag collection. Lightweight with strong shoulder straps, this bag is perfect for those seeking adventure. Practical, stylish and definitely fashionable, this vintage inspired handcrafted distressed leather backpack is an excellent choice. Measurement approximately 13.5" ( L ) x 16" (H) x 5" (W). This Vintage backpack is fashionable enough to be carried for every day use. This classic retro vintage backpack will last for years to come,handmade by professional artisans. Backpack includes a roomy main compartment with a flap over closure. The spacious functionality allows holding a variety of everyday essentials including laptop, Ipad, mobile phones, cosmetics, camera, books, lunch boxes and many more things which makes this backpack perfect for hiking, college, work, travel, camping or any other adventure. Finelaer bags are practical, long lasting and a great value. It is a perfect collection for the person seeking traditional good looks with a non trendy modern flair and is ideal for family and friends. If you have any questions about this product by FINELAER, contact us by completing and submitting the form below. If you are looking for a specif part number, please include it with your message.